Question: Can I take your supplements if I’m taking prescription medications? Only if you want to feel better and get well. 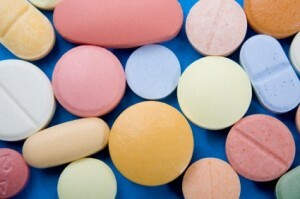 There is a misconception that nutritional supplements may be dangerous if taken with medications. In some cases this may be true. However, there few contraindications for taking the vitamins and minerals I recommend. The only contraindication that comes to mind is surgery. Vitamin C and fish oil can increase bleeding times and should be avoided a few days before having surgery. Question: Should I stop taking my prescription medications? I don’t recommend you stop taking your prescription medications until after you start feeling better on my program. Stopping medications can trigger a host of withdrawal symptoms. Start taking the supplements I recommend, build your stress coping system up, and allow your body to start healing itself. After you start feeling stronger (it may be a few months) then with the help of your doctor, slowly start weaning off the medications. Most of the medications can be weaned off and never missed. Some medications will have to be re-started until you become stronger or find other less toxic options. Question: Do I have to use your supplements or can I get them at a health food store, Walmart, or pharmacy? No, you don’t have to use mine. You can use other supplements. Make sure they are based on optimal daily dose. I try to use the purest nutrients I can find. I also try to keep cost down. But, if I have to choose between quality and price I’ll choose quality. I do this because it is not what you take but what you absorb that matters. The Essential Therapeutics line of supplements is guaranteed to be digested with in 45 minutes. Also look for products free of fillers, artificial colors or additives. I use products that are free of yeast, sugar, wheat, dairy, colorings or artificial coloring. I’m pretty picky about the supplements I use. If I’m going to be recommending supplements for tough illnesses like fibromyalgia, CFS, diabetes, and other chronic conditions, I want to know I’m using the best products available, so should you. Question: When I try to take fish oil I taste it all day. When I take fish oil I get bloating, gas or indigestion? Why are fish oils so important? Can I take flax seed oil instead? Many individuals have become deficient in the enzymes needed digestive certain oils, including fish oil. Try taking a digestive enzyme along with your fish oil capsule at each meal. This should do it. If not, hang in there or switch to flax seed oil. The most important part of fish oil is DHA. Deficiencies are linked to mood disorders, depression, anxiety, fatigue, ADHD, and poor immune function. This long chain fatty acid isn’t in flax seed oil. Sixty-percent of the U.S. population is deficient in Omega 3 fatty acids. These oils also reduce help boost hormones that naturally reduce allergic reactions, pain and inflammation. Question: I feel a lot better after taking your CFS/Fibro Formula or Basic Multivitamin/mineral Formula but now I have diarrhea. What should I do? Try taking the white oval magnesium tablet out of each packet (CFS/Fibro Formula). Magnesium is a natural muscle-relaxant (the colon is a muscle). If you take too much magnesium you can get loose bowel movements. If this doesn’t stop the loose bowel movements, try taking one pack a day instead of two (applies to both formulas). I’d also recommend you start taking a digestive enzyme with each meal. Make sure you take the CFS/Fibro formula with food. A low serotonin state will cause irritable bowel syndrome. Taking 5HTP will boost serotonin levels and IBS usually goes away in one to two weeks. If you are constipated then you’re low in magnesium. Magnesium gets used-up rather quickly (used in each cell to generate energy) when we get under too much stress. Another sign you are low in magnesium is when you have muscle twitches or spasms (Restless Leg Syndrome). Question: Will I have to take these supplements for the rest of my life? No, at some point you can stop taking some of the supplements but you’ll always need to be on a good optimal dose multivitamin/mineral supplements. The best health insurance is the commitment you make to taking good care of yourself. Taking nutritional supplements helps fill in the gaps in our ongoing health program. Do you eat 6 servings of fruits and vegetables a day? Can you avoid all toxic pollution (air, water, stress)? I don’t want to breakdown and become chronically ill at 50 or 60 or 70 and live the rest of my dependent on drugs, surgeries and hospital care. Too many people die with their music still in them. They are dead long before their heart stops beating. I’ve seen several people I love succumb to the usual ravages of old age and poor health. Not me! Research shows that taking essential nutrients and staying active physically, mentally, and spiritually keeps us young (no matter what age) and healthy. Question: I’m trying to get pregnant can I take the supplements you recommend? I’d recommend the regular multivitamin 2 tablets twice a day with food. Prenatal vitamins are a waste! Based on RDA recommend disease allowance (see last months newsletter). I’d also recommend you take 3,000mg of fish oil each day. I wouldn’t recommend taking any other supplements.